Arnold Paole (otherwise known as Arnold Paul) was the subject of one of the most famous 18th century vampire cases. During the 18th century there was a “wave of vampire attacks” in central Europe. This outbreak in vampire attacks caused a resurgence of revived interest in vampires in England and France in the early 19th century. Arnold Paole was born in the early 1700s in Medvegia, which is north of Belgrade, in an area of Serbia then part of the Austrian empire. Paole served in the army in what was then called Turkish Serbia, where the Hapsburgs were trying to capture lands in Serbia from the weakened Ottoman Empire. Arnold returned home in 1727, where he purchased several acres of land and settled down to farm. He was pursued by a young woman from a neighboring farm and the two later became engaged. He is described as being a good natured, honest man, who was welcomed by the townspeople upon his return, though a certain gloom dulled his personality. 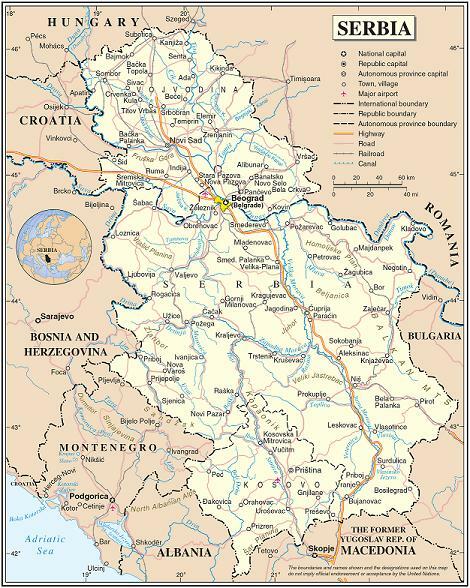 Above: A map of Serbia. Medvegia is said to be located in the North, near the border with Hungary. Arnold eventually told his fiancé that this gloom resulted from his war days. In Turkish Serbia, Paole had been attacked by a vampire, which he eventually killed after following it to its grave. Arnold then ate some of the dirt from the tomb and bathed his wounds in the blood of the vampire in order to cleanse himself from the attack. Arnold was fearful that he had been tainted by the vampire. My sources do not describe what happened next very clearly, but it seems that Paole suffered from a fateful accident a few weeks later and was buried immediately. Three weeks following his death, reports of sightings of Arnold Paole surfaced. The four people who made these reports died, and a panic began to spread. The townspeople decided to disinter Paole’s body to see if he was a vampire. On the 40th day after the burial the grave was opened. The townspeople found a body that appeared as if it had just recently died! What seemed to by a fresh, new layer of skin was present under a layer of dead skin, and the nails had continued to grow. The body was pierced and blood poured forth, which influenced the townspeople to decide that Arnold Paole was a vampire. He was then staked, and it is said that he uttered a groan as if in pain. His head was severed and his body burned in order to totally eradicate him. The four others who had died were treated similarly, to prevent any more attacks, lest they had been infected. Later, in 1731 in the same area, 17 people died of symptoms of vampirism in a matter of 3 months. The townspeople were slow to act until a young girl said a man named Milo, who had recently died, had attacked her during the night. Word reached Vienna about the “attacks,” and the Austrian Emperor ordered an inquiry be conducted by Regimental Field Surgeon Johannes Fluckinger. Fluckinger headed for Medvegia on December 12, and gathered accounts of what had happened. Milo’s body was disinterred and was found in a state similar to Paul’s. The townspeople were confused, how could the vampirism that was previously eradicated in 1727, have returned in 1731? 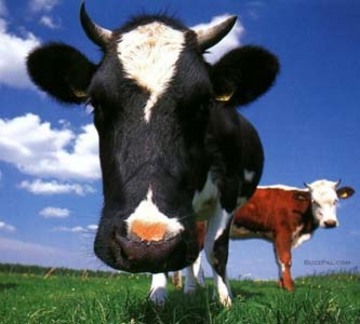 It was determined that Arnold Paole had vampirized several cows that the dead had recently fed on. Interesting. Under Fluckinger’s orders, the townspeople began to dig up all of the bodies of the recently deceased. Forty bodies were disinterred, and 17 were found to be in the same preserved state as Paul’s and Milo’s bodies. All of the bodies were staked and burned. This scene reminds me a lot of Interview with a Vampire, by Anne Rice, when Louis and Claudia go to central Europe to find other vampires like themselves, and discover a town in hysterics over vampires. The panic led the villagers to disinter several bodies, and an Englishman visiting the town described the scene, “I tell you, she was as fresh, as pink…as pink as if she were still alive! Buried six months!” (from page 176). When I had read that scene in Interview I assumed it was a dramatization, but it appears after reading about Arnold Paole, that this sort of hysteria did occur. In 1732, a report of Fluckinger’s activities was presented to the Emperor. This report soon became a bestseller, and by March 1732 the accounts were being circulated in papers in both France and England. Due to the documentation of the case, these attacks became the focus of future studies and reflections on vampires, and Arnold Paole became the most famous “vampire” of the era. Such reports of vampire activity caused a stir. Since so many bodies had been mutilated in relation to these cases, the Church became involved. It was atrocious for some Catholics to imagine the bodies of Christians who were awaiting resurrection in their death to be mutilated and thus incapable of going to heaven. Paul’s tale launched a heated debate in the Church over vampirism. Giuseppe Davanzati was reeled in to the debate at the request of Cardinal Schtrattembrach, the bishop of Olmutz (Germany), who sought the church’s advice on the supposed vampire attacks. Davanzati was a learned archbishop from Trani, Italy. Davanzati spent 5 years studying the vampire problem, and believed that the issue resulted from human fantasies, possibly of diabolical origin. Davanzati urged that pastoral attention should be directed to the person reporting the vampire, and that bodies should be left undisturbed. While Davanzati was pursuing research, Dom Augustin Calmet was also attempting to answer the vampire problem. Calmet was known throughout France as a Bible scholar, and his dissertation dealt with vampires. Calmet described in detail reports of Eastern vampires and called upon theologians to give these subjects serious study. Calmet argued that the bodies were animated by devils or evil spirits, which was a throwback to medieval thinking. Calmet did not find as much support among contemporaries for his beliefs as Davanzati did, but Calmet did hold popular support. There are many explanations that have been presented which may explain these instances of vampirism. One popular explanation was premature burial, which explained why corpses did not deteriorate. Catalepsy was a disease which makes the infected appear as if they are dead, which may have prompted premature burial to occur. Others say perhaps something in the soil or an unusual lack of moisture may have slowed decay. Shrieks that occurred when bodies were staked may have resulted from air leaving the corpse. Some suggest that the plague may have been the true cause for the vampire outbreak, since an epidemic of the plague occurred simultaneously with the vampire outbreaks, and the spread of germs may have accounted for the vampire symptoms. Rabies may have offered another explanation, since people with rabies would bite, had animal characteristics, and had an unquenchable thirst. Rabies epidemics occurred at this time in Hungary, Saxony and East Prussia. Other diseases, like Porphyria, may have provided an explanation. Porphyria has a symptom which causes the infected to have a severe sensitivity to light. 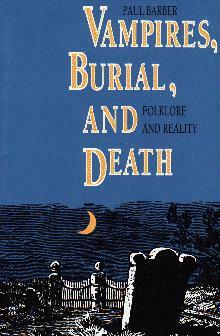 Above: Paul Barber’s book, Vampires, Burial and Death: Folklore and Reality. A copy can be found here. The explanation I tend to agree with the most is that the villagers who disinterred the bodies of suspected vampires were simply viewing the bodies decay naturally, but the symptoms they witnessed did not live up to their expectations, so vampirism was used to explain the unexpected. Paul Barber offers a report which backs this claim, in his book Vampires, Burial and Death: Folklore and Reality.